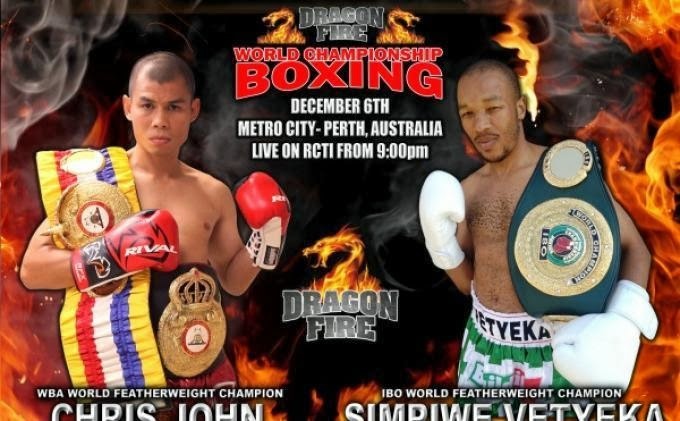 The video replay highlights of Chris John vs Simpiwe Vetyeka 2013. We are going to show you for the first time of today's one of the elite and legend Indonesian Chris John's first career lost and for the first loss in his 15 year prime of sports of boxing. He lost to Simpiwe Vetyeka. The fight is highly remarkable for the Indonesian pride and fighter Chris John. This is a fight to remember for IBO and WBA Super World featherweight titles held on December 6, 2013, Saturday night at Metro City, Northbridge, Australia. If you could see the video replay highlights of Chris John vs Simpiwe Vetyeka, it was such an exciting fight where the Chris John retired at round 7 due to early knockdown and battered from round 5 and 6. Watch the video replay highlights of John vs Vetyeka fight. Many boxing fans thought that John is not the same boxer from the past years of his career. John had been hurt in the 5th round from a right hand from Vetyeka that hooked around to the back of John’s head that put him out on his feet. John was somehow able to make it out of the 5th, but he was in bad shape for the 6th. He still didn’t look recovered from the blow, and he also looked very tired. The 34-year-old Indonesian lived dangerously throughout the bout, swinging wildly without using his jab, despite having a clear reach and height advantage over Vetyeka. John once again stood up and was saved by the bell. He wobbled back to his corner on unsteady legs, where he would remain in resignation. Vetyeka's victory comes less than 24 hours after former South African president Nelson Mandela died at the age of 95. A jubilant Vetyeka (26-2, 16 KOs) dedicated the fight to the late anti-appartheid activist. "I dedicate this fight to the former president of South Africa, Mr. Nelson 'Mandiba' Mandela. I won this title for him," said Vetyeka. Acording to one of the netizens comment, "Chris John is only in the fight the first two rounds..He touched the canvass 5 times before the 6th..He looked tired maybe dehydrated..He's been fighting as featherweight for a long time and I think featherweight is not his comfortable weight now..Losing weight to featherweight limit paid dearly for him...He should go up to super featherweight or lightweight if he wants to continue his career.."
It was the sweetest victory for Simpiwe Vetyeka that could be added to his resume to be one of the elite boxers in the world as he beat the legend Chris John for the first time in his 15 year career prime. Congratulations Vetyeka and more belts in the future! Here's the video replay highlights of Chris John vs Simpiwe Vetyeka fight. I hope you enjoy watching the video replay highlights of Chris John vs Simpiwe for IBO and WBA Super World featherweight titles. Thanks for watching and till our next installment of the sports of boxing event only right here.